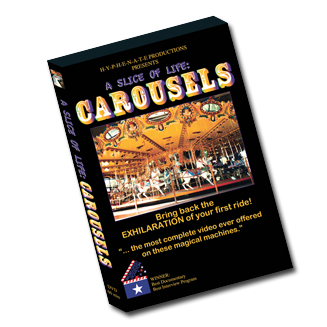 A Slice of Life: Carousels has been declared by enthusiasts as the most complete video ever offered on these magical machines and animated animals; and heralded for its compassion and many touching moments. Some highlights include: *a detailed look at 8 carousels. *private collections. *carvers/collectors/restorers. *a convention. *a record-setting auction. *and most importantly-- intimate, revealing conversations and recollections, of novices and experts alike, on this subject that keeps them youthful in their outlook on life; and hopeful for man's continued ability to create.